Worked in continuous rows. Be sure to use a stitch marker. Place stitch marker and move it up with each round. Sl st 14. Ch 11. Sc into 4th ch from hook. Sc 7. Sl st onto shoe. Sl st 17. Tie off, weave in ends. Sl st 28. Ch 11. Sc into 4th ch from hook. Sc 7. Sl st onto shoe. Sl st 3. Tie off. Weave in ends. Sl st 16. Ch 11. Sc into 4th ch from hook. Sc 7. Sl st onto shoe. Sl st 19. Tie off, weave in ends. Sl st 30. Ch 11. Sc into 4th ch from hook. Sc 7. Sl st onto shoe. Sl st 5. Tie off. Weave in ends. Place your stich marker and move it up after each round worked. Sl st 15. Ch 12. Sc into 4th ch from hook. Sc 8. Sl st onto shoe. Sl st 20. Tie off, weave in ends. Sl st 31. Ch 12. Sc into 4th ch from hook. Sc 8. Sl st onto shoe. Sl st 4. Tie off, weave in ends. 1. Sc 4 in 2nd ch from hook. Sc 6. Hdc 2. Dc 5. Dc 7 in last st. Working across opposite side of ch: dc 5, hdc 2, sc 6. (37 sts) Place your stitch marker and move it up with each round. Sl st 16. Ch 12. Sc into 4th ch from hook. Sc 7. Sl st onto shoe. Sl st 15. Tie off, weave in ends. Sl st 32. Ch 12. Sc into 4th ch from hook. Sc 8. Sl st onto shoe. Sl st 5. Tie off, weave in ends. Ch 2. Hdc 10 into ring. Pull tight, join with sl st. Tie off. Finish your shoes by sewing your button where your strap meets the other side of the shoe. Attach the dot with a yarn needle or simply with a dab of hot glue. any chance there is a video tutorial for size 6 of this pattern? I am working the size 8 pattern of toddler Mary Janes and on end 8 it says sc on one side of the slipper and do on the other that makes it lopsided. Is that a mistake? Yes it is a mistake! Thank you for catching that. It should be sc. Hi, this pattern was so enjoyable to do. Thank you. My question is, the button, is it supposed to be sewn permanently? I’m assuming. Thank you! Yes, the button is functional. These slippers are the cutest! I cannot believe I was able to make these. (Proud of myself!) Thank you for your simple pattern, the helpful video, and your answers to questions. My one year old loves them! Now I need to find a pattern for my older daughter! Iam working on the toddler Mary Janes, but in two colours. Can you tell me where i have to put the BLO row ? And if i can continue with this pattern? Iam making the size 8. There is no BLO row, so you can just work the pattern normally, adding your second color wherever you would like. My little niece loves these little slippers she’s now in her second pair. Her older brother also likes her slippers so I am attempting to make him a pair. I am working off the pattern for size 8 and I have increased it by 4 stitches in the initial chain (from 16 to 20) and the sc up and down the sides (from 14 to 18). I did not increase the heel or toe. So far they’re coming along nicely. However, I am up to row 8 and I am not sure how to increase or which stitches to increase. I notice that you have updated your pattern for these. My version is from a couple of months ago and is slightly different. Not sure if that matters or not. Either way can you tell me how to increase in row 8? Glad you like the pattern! You should be working decreases in row 8. Decrease on either side of the heel, and decrease all around the toe. I can’t give you specifics, since I haven’t make larger sizes, but let me know if I can assist further, and I will try my best. These are adorable! What a great little slipper to wear around the house. Thanks for sharing at Merry Monday this week! You always share the cutest ideas! I love the colors you choose for these cute mary janes!!! Thanks for sharing at the Monday Funday Party!! These are my daughter’s favorite slippers but she is now a size 10. Any chance you can share a larger pattern? She wore them to pajama day to her kindergarten class and now even her classmates are asking me for a pair. I would even wear them myself in an adult size. I love this pattern but now need a size 11. Any help will be appreciated. I’m having a problem reading your pattern. I you the kindle app to read it, but you. Black water mark is blocking out the patter on every page. Hi. Your black watermark is blocking out most of the pattern so I am battlingbto read it. Would love to make this for my daughter. Can you maybe lighten your watermark or even load the pattern here on your page. The watermark is a very light gray. Sometimes some apps won’t display it correctly. I think Adobe Reader works best. Although, I am currently in process of adding the patterns in-text, and reformatted the PDFs, so I hope to get to that within the next few weeks. Oh no! How can I help? What are your specific problems? Yes, the sole is the first 4 steps. Hi, I just made these size 8 slippers for my daughter. They came out about 2 sizes too small. I used Caron yarn and an F hook. I’m going to try the next hook size up next time. Do you have this pattern in any larger sizes? My daughter is about an 8.5 size foot now. Thanks! I don’t! I only have baby and toddler sizes. The hook size is just a suggestion, but since your gauge is different than mine, you can go up hook sizes (or use bulkier yarn) to reach the right size. I’m sorry, I hope this helps! I need help, I have no idea what I’m doing wrong, I’m a beginner crocheter, I think I’m doing all the stitches correctly, there’s a tumblr with gif’s of them all, but I have to be doing something wrong, all goes well up until 6 where what I think should be the stitches that go over the toes, end up on the side. I finished the whole thing and there was a big bulge out to the side of the shoe, and nothing where the toes would go. I’ve remade it like 5 times now and the same thing keeps happening. No idea what I’m doing wrong. Oops sorry! Are you using a stitch marker and coming back to it? I misread the title of the pattern you are having a problem with. Hi, I’m having a little trouble with rounds 6-8. After round 6 there should be 42 st, but 7 counts as 41 following the pattern. After round 7 there should be 34 st in round 8, but the pattern counts 35 in round 8. This is for the size 5 written pattern. Yes, it appears there is a typo. In round 7, the last part should say sc 10 instead of 9. The rest appears to be correct. Hi – thanks for this pattern! I’m excited to see the final product but am stuck on step 9. It’s not clear to me how to make the strap across the slipper. Does anyone have some tips on that step? Never mind. I was just reading it wrong. I’m having issues with the size of your gorgeous little shoes (well all of your toddler and baby shoes) they are all coming up small ? I’m using the same size hook and medium yarn? Completely mind boggled by it all here contemplating just going up a hook size? Just a thought are they US shoes sizes? Do they naturally come a little small compared to UK? Well gauge can be a bit tricky as its rather unique to each crocheter. These are in us sizes, and although I know the sizing is different, I have no idea how they compare. The size 5 would fit a 12-18 month old and size 8 fit my 2 1/2 yr old niece. Thank you! It is working in my end. What is it doing? Your computer settings might not be letting you download. The pattern is adorable, but I’ve hit a glitch somewhere. I originally did not put a stitch marker in and decided to frog it figuring that may have caused the problem. Now I do have a marker in and on the Toddler sz7 row 5 it has created 7 extra stitches. The sc2tg 10 times doesn’t seem to add up right. Please help! So glad you got it worked out! Hi Bethany, I have made these slippers in both the baby and toddler sizes but found the last row (Row 7. Sc2tog. Sc 4. Sc2tog. Sc 7. Dc2tog 4 times. Sc 6.) makes then far too tight around the heel. I opted to leave out the last decrease at heel (Row 7. Sc 15. Dc2tog 4 times. Sc 6.) and adjusted the last sl st. row accordingly. They now look perfect. Hi Bethany, have double checked my working and found my mistake. I needed to find correct conversion sizing for both wools and hooks. (I live outside of America) They now look adorable. May I suggest that on your faq’s page you could give a description of the abbreviations for the benefit of newbies. i.e. hdc 2tog is one some people get confused over. A comprehensive list (description of all stitches) would save the newbies having to search other sites for relevant information. 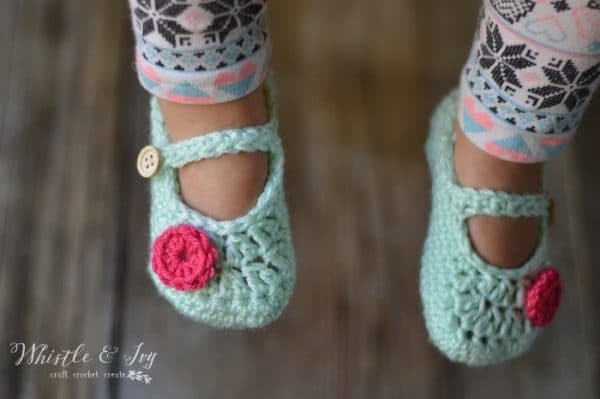 I want to make these in a size 11 in toddler. Is there a specific way I should do it, ie: switching up the stitches by X many. or can I change the size of the hook and it work that way too? You could definitely try a bigger hook and bulkier yarn, that would be easiest. To alter the pattern, for the sole I usually go up 2 chains for each size up, but if you want to make the shoe thicker, you will want to work an extra round, and remember to take that into account for the finished length. (also, work the increase correctly by adding another single in between the doubles) It would be a bit of trial and error, but definitely doable! Yes. Sorry about the small typo. That’s ok. I did hdc2tog and it worked. They turned out really cute!! I love your patterns! They are so easy to understand, some patterns don’t make sense to me cause I’m a beginner, but yours are so great and cute!! Thanks!! 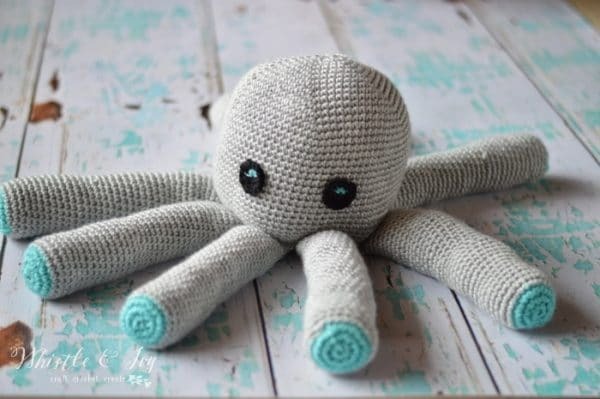 I would really like to try making these for my granddaughter but I can not get it to download to my computer. Is there a different way that I can get the pattern? I’m sorry this is the only way. Do you have a current version of adobe reader? I also tried your pattern for the size 8 toddler size but row 4 doesn’t seem to add up. I have about 7 stitches left. I am using a stitch marker. I looked at the same pattern for baby’s and the 5th row was sc around and hdc on the last stitch. But there is no such row on the toddler sizes. Also, is that 5th row in the baby pattern only on one thread? Instead of both like you would normally crochet? I’m not sure if I’m explaining that part right. Thank you in advance for your response. The toddler is a larger shoe, so the sole has an extra round to make it wider (where the baby one goes right into the rest of the shoe after the 3rd round). It sounds like you are not doing the increases correctly. Row 3 is 1 sc, 2 sc TOGETHER in the next st – repeated around the heel and toe. Row 4 is TWO sc (each in their own st, then 2 sc TOGETHER in the next st – repeated around the heel and toe. Hello again. I tried the pattern again and it is still coming out with needing 7 extra stitches. I even counted the stitches on paper just to make sure I was doing it right. I understand that row 3 asks for 1 sc in one stitch and 2 sc on the next stitch, repeat 3 times. 14sc. 1 sc in one stitch and 2sc on the next stitch, repeat 5 times. 14 sc. That would equal to 52stitches. Row 4 is 2sc in one stitch, 2sc on the next stitch repeat 3 times. 14sc. 2sc in one stitch, 2sc on the next stitch repeat 5 times. 14sc. That equals to 60 . That is where I am getting the 8 extra stitches. Please tell me where I am going wrong. thank you. No, the 2 sc are in their own stitches. 1 sc, 1 sc, 2 together in the next. 1 sc, 1 sc, 2 together in the next. The problem for me starts at step 4 of the toddler sizes, I have made the baby slippers no problem they turned out lovely! As there was also an increase in step 3 there is an extra 6 stitches left. I am going to try adding an extra stitch to the heel and toe and one for each side and see how it turns out. I took pictures of each step to give you a better idea, however I can’t seem to insert them. If it helps I could send them by email. (Sc	1,	Sc	2	in	next	st)	3	times. Sc	13. (Sc	1,	Sc	2	in	next	st)	5	times. Sc	13. (sc	2,	sc	2	in	next	st)	3	times. Sc	13. (Sc	2,	sc	2	in	next	st)	5	times. Sc	13. Step 4 is exactly like step three, you just work 1 extra stitch in between the increases. Does that make sense? Bethany, these are absolutely adorable! 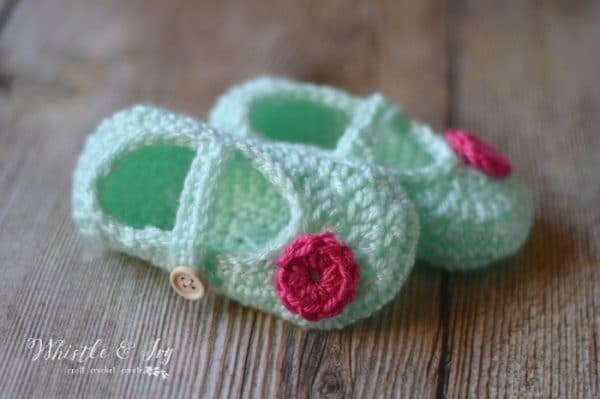 I would love to make a pair for my friend’s daughter, but she’s a size 10. Would you be interested in publishing patterns for size 9 and 10? Or do you have any quick tips how I could make this work? Thank you! You can go up 4 chains on the foundation chain (adjusting everything else accordingly) or you could use bulkier yarn and a bigger hook with the size 8. (hook and bulky yarn would definitely be faster!). Good luck, I am glad you like the pattern! I don’t! But I bet I could make one eventually! I’m having a problem with the size 5. Step 4. Is it 2 sc in the next 6 stitches 10 sc 2 sc in the next 10 stitches. I’ve made a lot of your patterns this one just isn’t working for me. I know it’s a small mistake by me I just don’t know where. Thanks !! No, you repeat the parentheses in the correct order. (sc 2, sc 2 together in the next st, sc 2, sc 2 together in the next st, sc 2, sc 2 together in the next st. sc 10 down the side. Repeat what is inside the parentheses 5 times for the toe. Sc 10 down the other side. I, too, had problems making this pattern (size 8). I tried to fix it myself, by adding 16 or 18 stitches between the heel and toe ends, also adding some stitches at the heel and toe ends…however, it still is not right. I’ve tried numerous times so that I could get it to work. Could you please revisit your pattern, try it yourself, and let us know what needs to be changed?!! 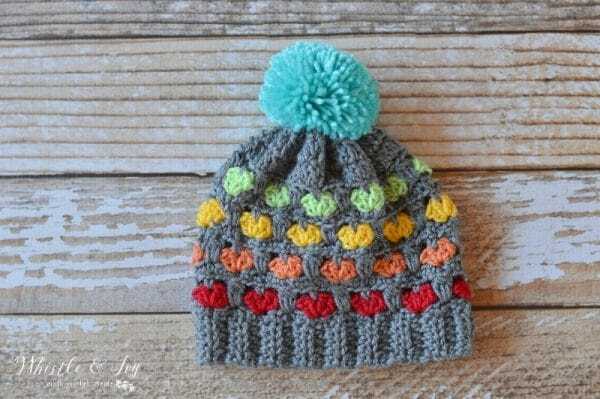 I do love this pattern, and really want to make it for my little girl… Thank you!! What specific problem are you having? I work them extensively before publishing, and I didn’t see anyone else commenting about a specific problem. I can try and troubleshoot a problem that you are having and see if we can find a solution, if you can explain more about what is going on with the pair you are trying to make. I think I’m having the same issue Bree is (I’m making the size 6 though). I’ve also tried various tricks on my own but it always seems like my increases aren’t in the right place and they just don’t look right. Steps 2 and 3 are where my problems seem to start and they just compound from there. Some pictures would definitely be helpful. Thanks! If you could specify what kind of picture would be helpful, I can definitely do that! Great! I think pictures of where the increases start in relation to the rest of the piece would help out most. I hope that makes sense. Thanks! And you absolutely MUST use a stitch marker. I assumed people would, but I added it into the pattern so people will know. Hi melissa, I sell in my Etsy shop, but I sold out for the week. Check back on Monday morning and I will reopen my listing. Are these good for children learning to walk or not a good idea ,with dirt etc. I would imagine the bottoms aren’t too hard? I have a clubfoot baby and unthought this would be a good way to make her shoes I know that fit just for her :) thanks. Well, I think they are good as slippers. If you make them into shoes, I would defiantly cover the bottoms in something more sturdy, and probably non-slip. Good luck, the will definitely be comfortable! Just a tip. I found a way to make these (and any crocheted sandals & shoes) wearable outside or just sturdier. When finished, put cardboard or something inside the sandal to keep the shape you want. Then use Plasti Dip super grip, non-skid clear spray on the bottoms. It dries clear and creates a rubber-like bottom. :) You could also sew cheap flip flop bottoms to your sandals, after removing the flip flop straps that is. Both options look really easy to do. I’ll be trying the spray first. Hi there I am trying to open this pattern for the toddler pattern and it does not open. Maybe I am doing something wrong? It is just a google doc. Are you normally able to view those? I absolutely LOVE your pattern. Thank you so much for making these bigger patterns. 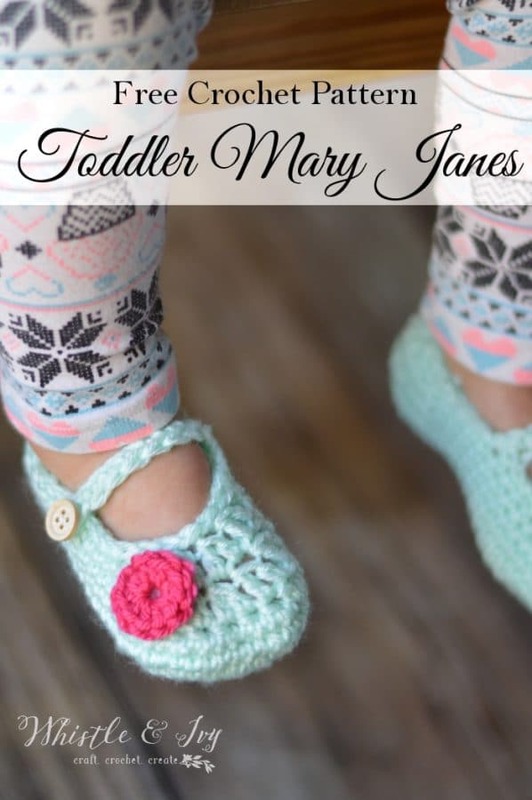 I have 4 girls and wanted to make them these mary janes for Christmas. I made 2 of the infant sizes for my younger 2 and was on the search for a larger pattern for my older 2. The size 8 is perfect for my 2nd oldest girl, so now I’ll only have to find a pattern for my oldest. thank you so much for sharing your patterns. They really are so adorable. I know my girls are going to love them. Thank you so much, and you are SO welcome :) I hope they do! Merry Christmas! Hello. 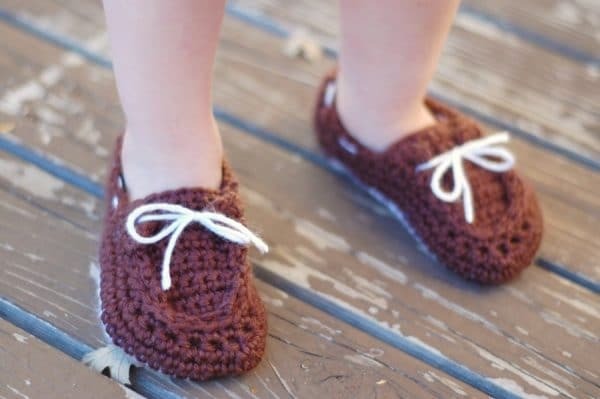 I am still very new to crochet and making my first attempt to making these slippers. I’m confused on one part of the pattern. What does D 4 mean in the first step of the size 6? Hi Rebecca, that is actually a typo! Sorry, that should say Dc(double crochet), not D.
Thanks so much! I will stop by ! These are super adorable for sure. I know some little girls who would really love to have these on their feet. Thanks, Mandi! My friends little girl loved hers! She practically wore them out in just a few weeks because she didn’t want to take them off, lol ! Hi these crocheted slippers are so cute! I saw it on homemade ginger. Can’t wait to make these! I made the infant version for my daughter and LOVE them!